Moving up in boat size doesn’t need to be overwhelming. When the classroom is aboard your own boat then learning is all the more fun. 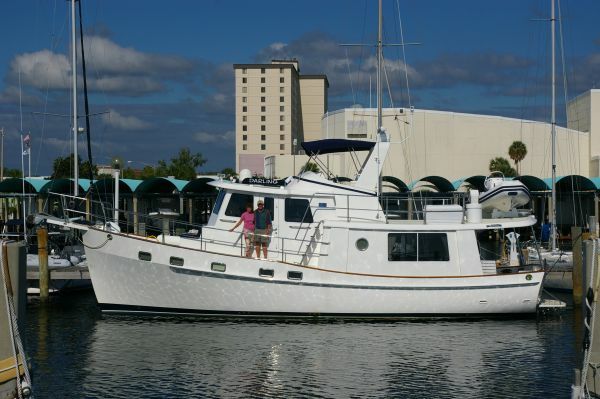 This is a learn-aboard experience for the new owners of a brand new Kadey Krogen 44. They asked us to help them move their new yacht across the Okeechobee Waterway to the west coast of Florida. Coming from a twin engine 36 foot Grand Banks, the owners have a working knowledge of a fair-sized vessel. 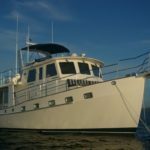 Graduating to a 44 foot full displacement single engine trawler with a bow thruster first requires a few days of new systems review for them with some additional practice at the helm. Before departure we worked on docking and anchoring skills, including a short tour of the rough ocean to experience the effectiveness of active fin stabilizers. 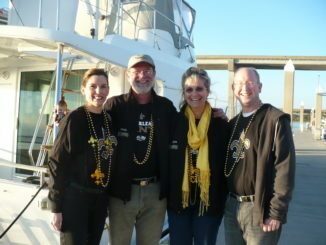 Their goal is to experience a true cruising adventure with more anchoring and less marina visits. 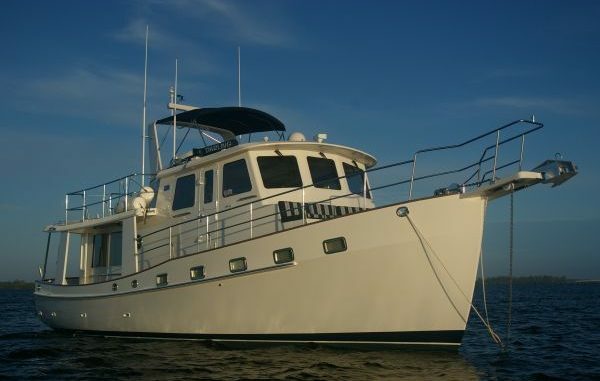 The boat is ready to go, so we plan trip routes and grocery lists, anticipating a five day run. Our first day we head south to “The Crossroads” and Mile 0 of the Okeechobee Waterway. After running up the St. Lucie River and through the Roosevelt Bridge we anchor in the North Fork of the river because we can not make another anchorage before dark. Lessons to be learned when you try to stick to a schedule. Flexibility helps assure safety. Pulling anchor the next morning, we are treated to a magnificient sunrise. 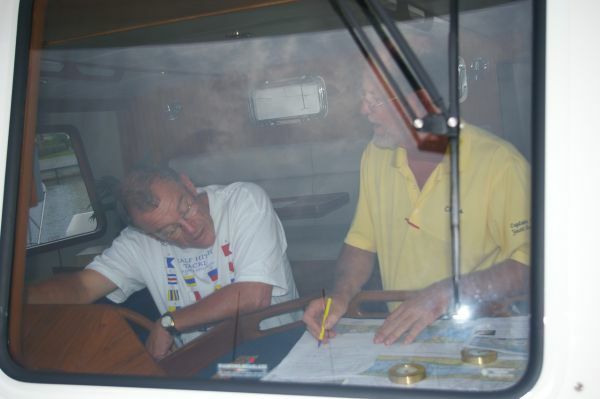 But more importantly this owner learns the answer to: “Chris, why do I want a SEA WATER wash down on my foredeck? Isn’t fresh water what I want to hose down my decks?” The anchor brought aboard more rich black mud than we’ve ever seen this side of the Georgia state line. Surely, we will empty the fresh water tank to hose off all THIS mud! After getting underway we fine-tune the art of locking through 2 locks and enter Lake Okeechobee with a beautiful calm crossing. Because we are traveling in the fall, daylight is shorter so we spend the night at Roland Martin’s in Clewiston. There we learn about line handling and improving communications with the dock attendant. Day three ends at anchor across from Fort Myers Municipal Yacht Basin on Florida’s west coast. We honed our locking skills earlier this day through 3 more locks, Moorehaven, Ortona and Franklin, each one with it’s own nuances including the different personalities of each lock master. As day four begins, once again we appreciate the sea water wash down when we pull anchor and head north up the west coast. We mosey across the Miserable Mile and up the ICW towards Sarasota. The wind is ferocious at 25 knots on our beam, making us ever vigilant to stay in the narrow channel, crabbing all the way. This part of the ICW is quite shallow and not at all forgiving if you wander off course. Scouting out a good place to tuck in for the evening, we decide on Gasparilla Bay. We review launching procedures for the dinghy, allowing us to take a few photos of their new baby on the hook. 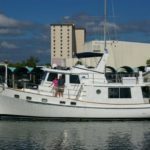 Planning to meet their friends, we arrive at Marina Jack’s for our second evening in a marina in downtown Sarasota – how nice to see the upscale restaurant and art district. Remember the “sticking to schedules” comment? Well, their friends are delayed and the weather window is narrowing. 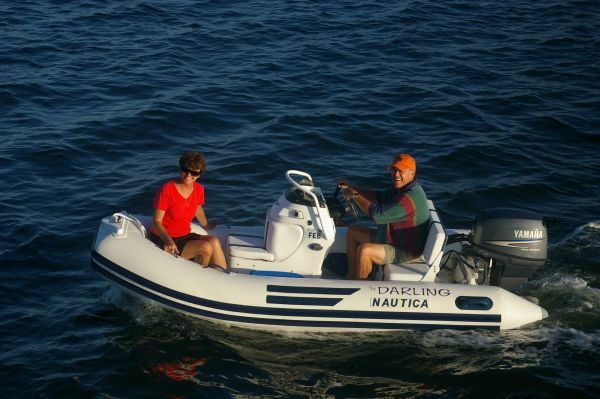 The time to make the jump to Apalachicola is at hand. Can we stay aboard and cross with them? Sure! Staying flexible is key so we readjust our float plan and reassess our needs. While Chris does an on-the-spot oil changing lesson with the new captain, Alyse asks for canvas bags to organize a trip to the grocery store. Bonus! It’s a Whole Foods Market only 4 blocks away. This is a terrific way to stretch our muscles while reprovisioning for the next leg to Panama City, FL. Back at sea, we enter the Gulf of Mexico from Tampa Bay aiming for Panama City, FL. As we ride through the night and into the morning, we take shifts standing watch to avoid crew fatigue. It’s imperitive to stay alert while at the wheel. 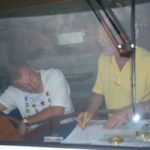 Good decisions are made by a well rested crew. 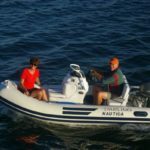 We check out the Sirious Weather Program on the RayMarine, learning the wind and seas are going to pick up. 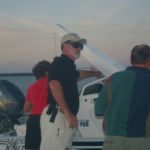 With this new information we change directions, heading for Apalachicola and Little St. George Island via Government Cut. We enter the bay as the sun sets with a beautiful calm glimmer. We drop the plow anchor again but this time it drags forever. Uh-Oh. Time to reassess the muddy bottom and change to the MAX anchor. Once again, as we retrieve the plow anchor and chain we have to spend a lot of time…you guessed it,…using the sea water wash down pump cleaning off the mud. The MAX anchor grabs the muddy bottom on the first try and we can relax for the night. At sunrise, the front arrives. The forecasted 25 knot winds are here but it’s No Problem Mon. We are prepared. Safely in the protected ICW we pull anchor and head inland to complete the cruise to Panama City. We write a formal summation certifying the different skills used during the trip and they are able to present this letter to their insurance company. 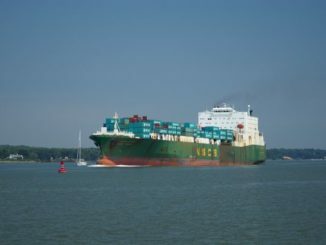 During their first long distance cruise they experience overnight passages, anchoring, dinghy launching while at anchor and even an oil change on the propulsion engine and generator. 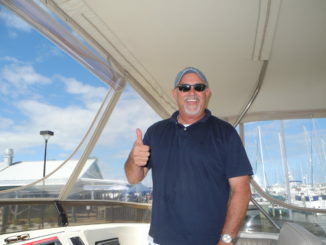 This is a terrific learn-aboard trip with the new owners becoming skilled in all the tricks of the trade. PS Three months later and these new owners are already old salts having made the Gulf Stream crossing to the Bahamas all on their own! 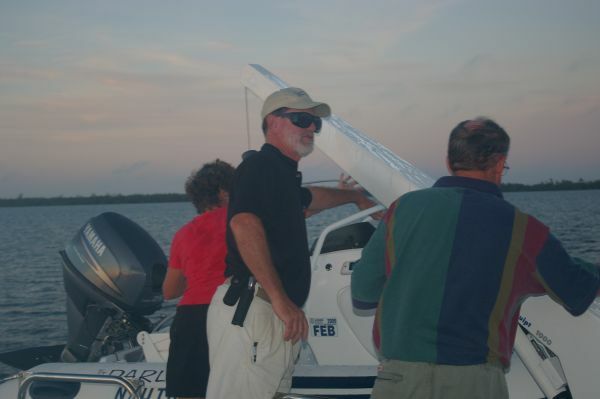 Call Captain Chris Yacht Services and we can help you become a seasoned captain and crew too!